I’ll be honest with you. This dessert is time consuming unless you have the kind of oven that can fit 3 pans to cook the puff pastry sheets all at once. Other than that, it’s easy to make and super yummy. How to make the filling: To make the filling, mix the sugar, flour, and vanilla with the water and cook at low heat stirring continuously with a whisk. When it starts boiling, keep stirring, and let it cook for about 5 minutes until it thickens. Put the flour and sugar mix in a glass bowl and set it aside to cool off. Use a mixer to beat the butter until it whitens with 1 vanilla tube or teaspoon of vanilla extract. Add the (cooled) sugar and flour mix gradually and continue beating. When it’s all folded in, add the condensed milk and beat for a few more minutes. The filling is ready! Put it in the fridge for at least half an hour. How to prepare the puff pastry: On to preparing the puff pastry. Lay the first sheet on the pan carefully to cover the size of the pan. Using a sharp knife remove the edges and save them aside (we’ll cook them later). Now, cut the sheet in two (across the long side) and bake at pre-heated 200 C/390 F oven for about 15 minutes or until golden brown. Remove the first two halves and save them. Repeat with the second sheet. When the second sheet is cooked, cook the edges that you removed from the two sheets. We will crumble the edges at the end and sprinkle them on top of the dessert. Now, we have four pieces of puff pastry sheets to work with. 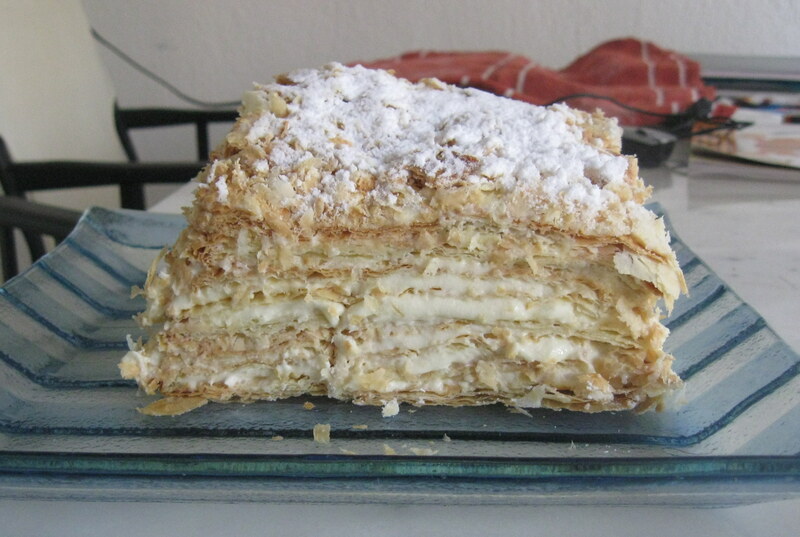 If you want to make the millefeuille as tall as in the photo you can cut each of the 4 sheets in two by separating the top part of each sheet from the bottom. This can be tricky, so don’t try it the first time round. It’s not really needed. How to put it all together: On to assembling the dessert. Lay the first sheet. Top with a layer of filling. Lay the second sheet, more filling, and so on until the fourth sheet is on top. Top the fourth sheet with the final layer of filling. Use your fingers to crumble the edges of the pastry sheets on top of the filling and all around. Sprinkle confectioner’s sugar generously and put in the fridge for at least 2 hours. Ready!